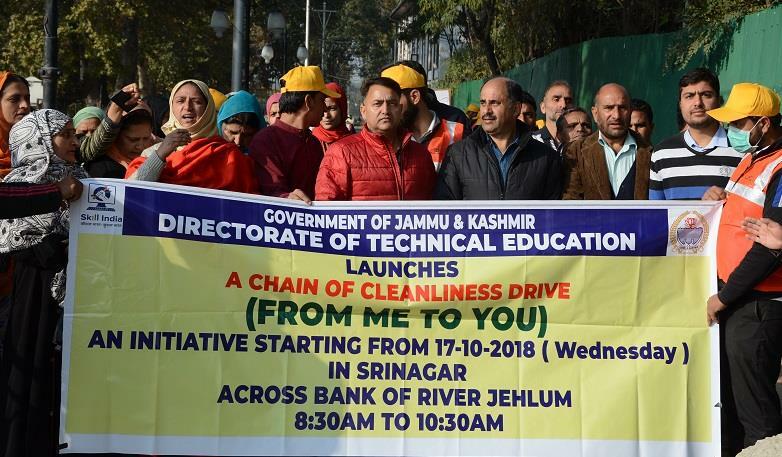 SRINAGAR, OCTOBER 18: The department of Technical Education has started a chain of Cleanliness Drive "From Me to You" in which a large of staff members and students participated. The participants were flagged off by the Joint Director, Technical Education, Kashmir. The programme started at 8:30 am on the Jhelum River Bank from Abi Guzar and continued up to Amirakadal Bridge Srinagar. As many as 120 trainees alongwith all the staff members of ITI Women Bemina participated in the drive. The participants were addressed by Joint Director Technical Education Kashmir and Superintendent Women ITI Bemina who briefed about the purpose and far reaching benefits of this cleanliness drive. A pledge was taken at the venue to continue this flagship programme of the Government.